Umm not sure if anyone noticed but I completely forgot (and I mean completely) about the last Baking with Julia recipe. It was for an Upside-Down Nectarine Chiffon Cake and it sounded delectable. But I forgot. So it's now on my to-bake list and I will get to it eventually. This week was another bread recipe which I was really happy about. Bread in general makes me happy! As with the White Loaves recipe from way back in February this was an easy to put together loaf which baked up perfectly. I knew I wouldn't be using molasses or malt extract (I'm trying to avoid buying ingredients that won't get used regularly) but didn't worry because I always have treacle in the pantry. Except this time I didn't. Oops. So I subbed golden syrup for both the honey and the malt extract and got a gorgeously golden and slightly sweet loaf that we all loved. As usual I snagged the crust while it was still warm and enjoyed it with a smearing of butter. You really can't beat homemade bread fresh from the oven! I cut and froze most of the 2 loaves, using most of it for toast and it was fabulous. Our hosts this week are Michele of Veggie Num Nums and Teresa of The Family That Bakes Together. They will post the recipe for this lovely loaf so make sure you check it out! It always makes me sad that bread recipes want you to wait until the bread has completely cooled before cutting into. As far as I am concerned, that warm crusty end is the best part! 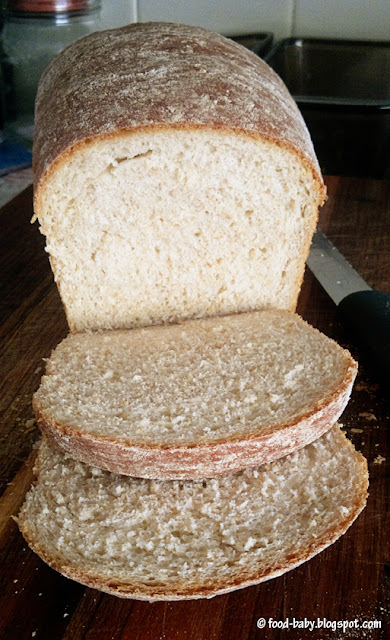 Yeah, can´t beat homemade bread. I loved this recipe and am glad you did too! Nice bread! Nice to know that golden syrup works in this bread. It's always better to use what's on hand. We were good and let the bread cool overnight, but there really is nothing better than bread right out of the oven. This recipe is a keeper, it makes perfect toast. Beautiful! We loved this one as well. Warm bread is the best and even better with butter!